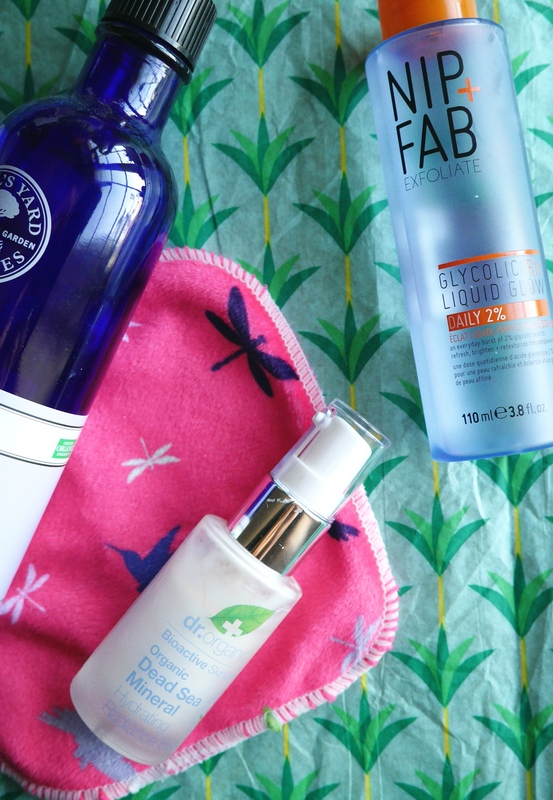 I am always on the hunt for the next exciting piece of skincare to transform my dry combination skin into glowy radiance and in the last few months quite a few new items have found there way into my collection. 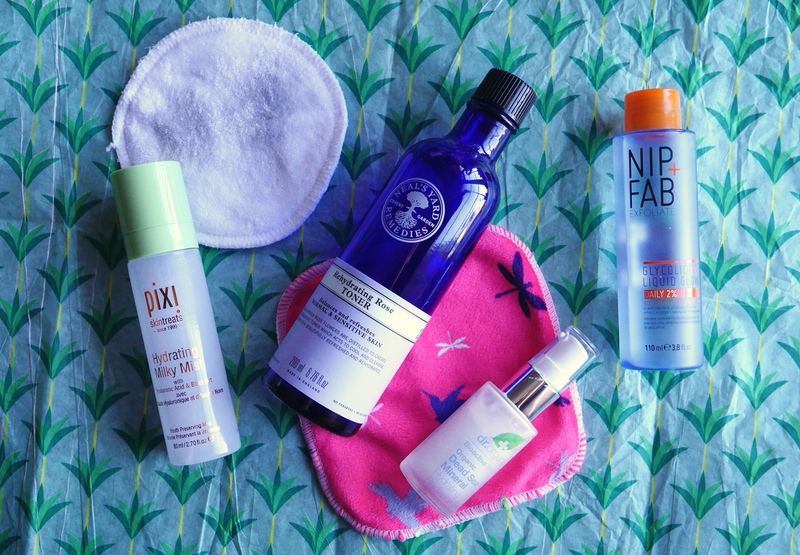 I did mention a few of these in my skin care diary post but they were more first impressions so I have the full low down for you now. 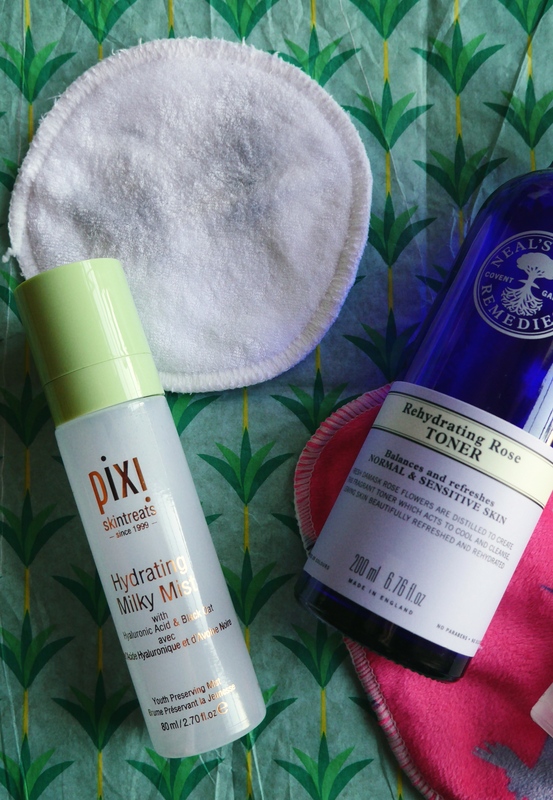 I haven’t had a toner in my skincare routine for a pretty long time, mainly because I switched to acid exfoliators and they rather replaced them however I have started using the Rose Toner in my morning routine after cleansing to balance and hydrate my skin as well as prepping my skin for my moisturisers the constant changing weather has made my skin more dehydrated than normal on my cheeks and forehead. It’s cruelty free, vegan and the glass bottle means although it’s not great for travel you can recycle the packaging. In a bid again to cut down my ‘beauty product waste’ I got rid of the very convenient ready drenched pads and opted for the old fashioned way. 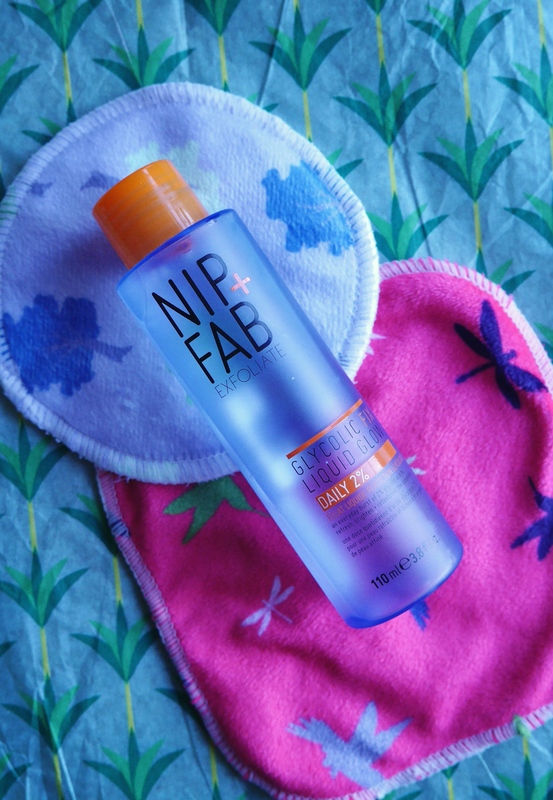 We all know how much I love the Nip+Fab Glycolic Acid so it was a no brainer to stick with the same brand but just opt for a big bottle of the good stuff dispensed onto my Cheeky Wipes. 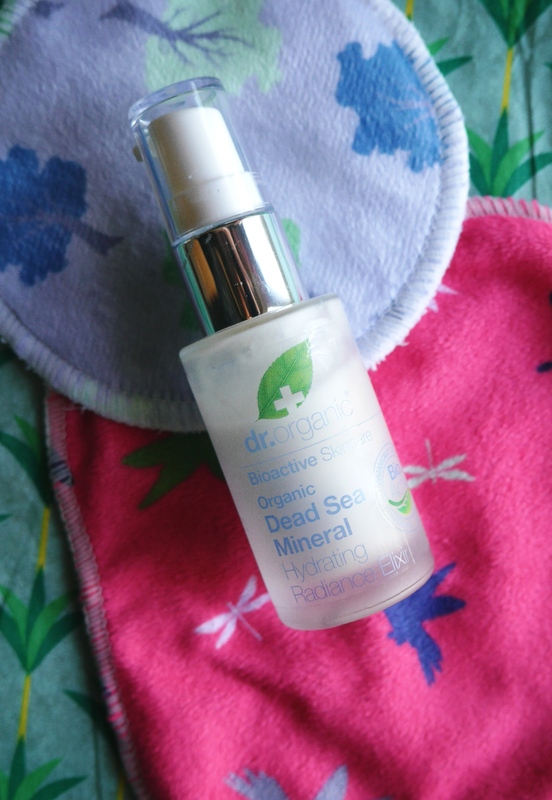 It works just as well and helps retexture the skin, remove dead skin cells, and has added hyaluronic acid to hydrate and rejuvenate the skin. 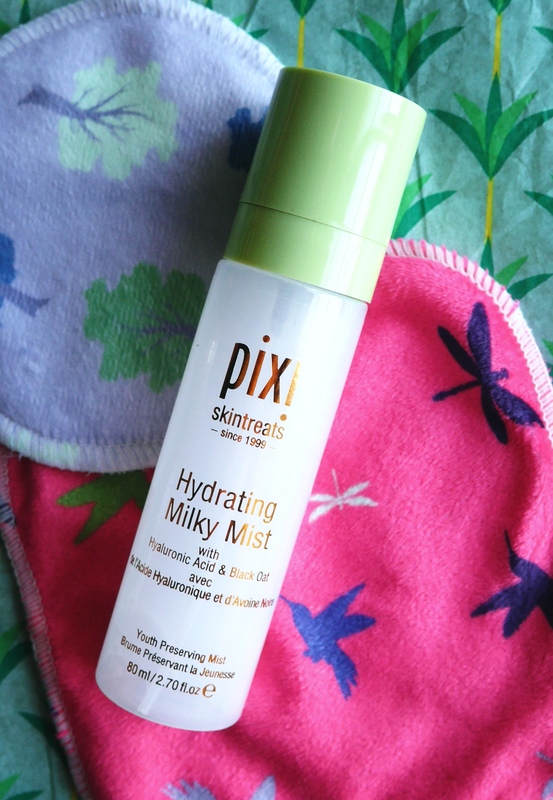 I love a lazy girl product and this hydrating mist is perfect for a quick fix of hydration both at the AM & PM. In the morning I spritz it before my moisturiser and in the PM I spray it after my acid exfoliator and before my serum. The added hyaluronic acid give the skin an instant plump and the black oat extract helps calm any inflation. I wouldn’t say it’s a miracle worker so if you are on a budget it’s not a must have but it’s great to add another layer of hydration. I hadn’t heard of this brand before I was gifted this by my sister so was excited to try it out. It’s not what you would expect from a radiance elixir as instead of being an oily consistency (which is what I expected) it’s cream based that makes the skin feel instantly tighter. For anti ageing I think this is a great product however I wouldn’t only use this serum as I don’t think it adds as much hydration as advertised. If you’ve got any skincare must haves let me know in the comments box below! 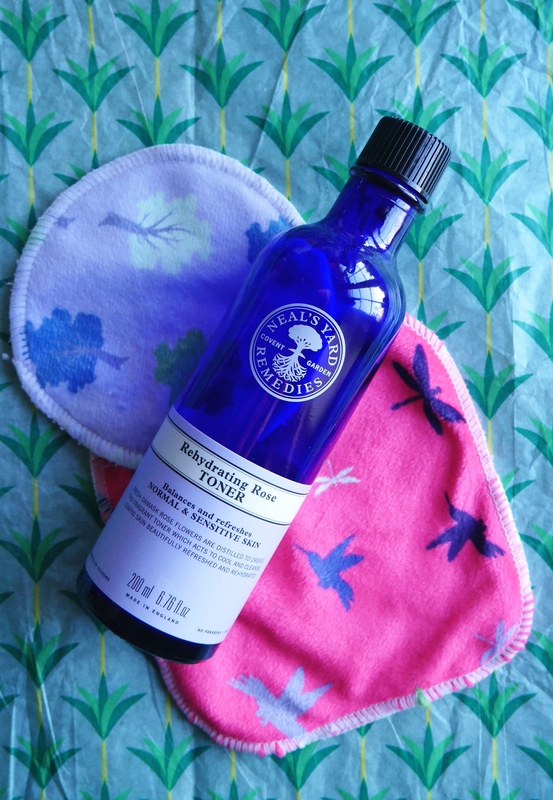 My must have is a serum with hyaluronic acid:) Where did you get your reusable cotton pads? I’ve been looking for some.